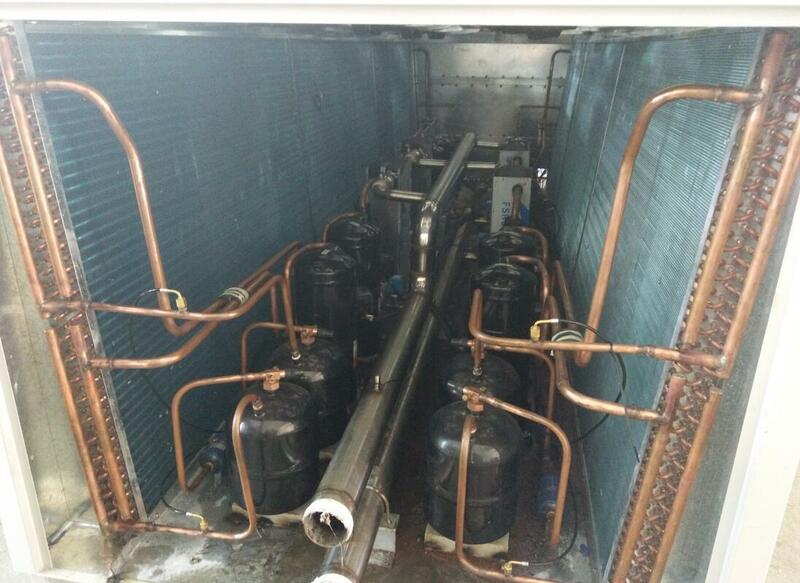 Air Cooled Water Chiller 200 KW with 8 pcs of Scroll Compressor uses air cooling to eliminate the cooling towers, cooling water pumps and piping systems necessary for cooling water systems, avoiding condenser fouling and water pipes in areas with poor water quality. Blockage, also saves water resources, is the most economical and simple machine for maintenance and repair of cold water air conditioning equipment. Air Cooled Water Chiller 200 KW with 8 pcs of Scroll Compressor uses air cooling to eliminate the cooling towers, cooling water pumps and piping systems necessary for cooling water systems, avoiding condenser fouling and water pipes in areas with poor water quality. Blockage, also saves water resources, is the most economical and simple machine for maintenance and repair of cold water air conditioning equipment. The annual operating cost is lower than that of water-cooled chillers. The construction cost of the equipment room is the smallest among various air-conditioning cold and heat source systems, and the maintenance cost is about half of the cost of water-cooled or boiler. The whole casing has a box-type structure, which is beautiful in appearance and compact in structure, and can check the operation of the unit at any time. The unit can bring its own water tank and circulating water pump according to the cooling capacity. It does not need cooling tower and cooling water pump. It is easy to install and maintain. Air Cooled Water Chiller 200 KW with 8 pcs of Scroll Compressor is used in plastic processing machine mold cooling, which can greatly improve the surface finish of plastic products, reduce the surface marks and internal stress of plastic products, so that the product does not shrink, deformation, and facilitate plastic products. The demoulding accelerates the product setting, which greatly improves the production efficiency of the plastic molding machine.